The FireKing® Model 635 fire-rated rolling service door offers superior protection wherever a listed insulated fire door is required (max. width 24’; max. height 24’). The Model 635 insulated rolling steel door serves as a thermal barrier, ideal for applications which require separation due to climate control requirements. The insulation used in this door offers added energy efficiency (R-value of 4.5), sound transmission control (STC 21), and the mineral wool utilized in the slat insert meets the Smoke and Flame Index of 5. Common masonry and non-masonry mounted applications include: facilities with paint booths, file rooms, material storage locations, warehouses, shared walls between businesses, public record storage, and public buildings such as libraries. The Model 635 insulated fire door is available with UL (FM optional) labels for 1-1/2, 3, 4 and oversized doors. These doors feature a mechanical auto resettable hoist (non-motorized) that enables easy drop test and reset of the fire door in just seconds. Fusible links are mounted on both sides of the wall that separate to automatically close the door in case of fire. Additional safety and protection features are available, including: Fire Sentinel® time-delay release device, FireLite® vision lites, smoke detectors, horns and strobes. 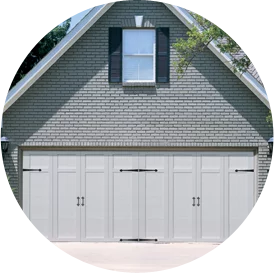 Actual door color may vary from the digital representation shown here. Color samples are available by request through your Overhead Door Distributor.